The structure indicated is the first lumbrical muscle of the hand. There are 4 lumbrical muscles which originate from the tendon of the flexor digitorum profundus muscle. The lateral lumbricals are unipennate, whereas the medial lumbricals are bipennate. 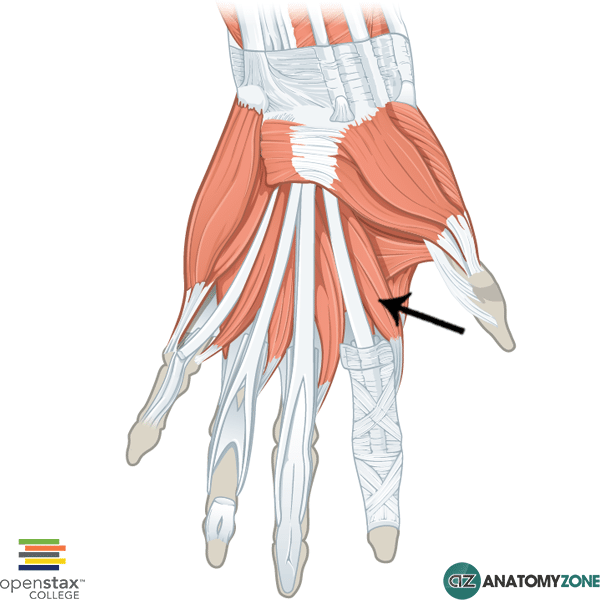 The tendon of the lumbricals pass dorsally to insert onto the extensor expansions associated with the tendons of the extensor digitorum muscle. Because of the unique structure of the extensor expansions, the lumbrical muscles act to flex at the metacarpophalangeal joint, and extend at the interphalangeal joint. Innervation: Lateral two lumbricals: median nerve. Medial two lumbricals: deep branch of ulnar nerve. Learn more about the anatomy of the hand muscles in this tutorial.